I don't know why but I lied. My brother says it is because I was protecting myself. Regardless, I lied. What I lied about was my mother and her path of suffering. In her memorial tribute I clearly stated in writing and in voice: I only wanted two things for my mother: to be with her when she died and for her to go peacefully. The lie is that I said I got my wish. But I didn't. 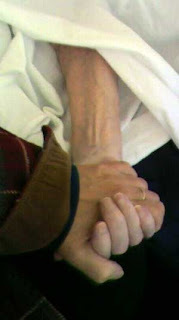 I was with my beautiful courageous mother as she let go, but she did not pass peacefully. Why did I say she did? Why was it so necessary to tell myself and others that her passing was peaceful, when in fact it was torturous? Two weeks before she died I was walking down the hallway toward the front desk where I could usually find her and I saw her facing the front desk alongside the hallway, closely examining the railing. It was at that moment I felt the painful state she was in, trapped in her body, trapped in her mind. She was nothing more than a prisoner; a very sad prisoner. Throughout her life Mayleen was strong and healthy. In the last two years with my overseeing her health decisions that strength carried her through all her physical trials. It wasn't out of the realm of possibility that she could last in this condition for years - miserable, unhappy and unable to leave her body. She was leaving me though, slowly but surely. I told her 50 times a night "I love you, Mommy," but now she only looked at me, detached and uninterested in returning my declarations of love. She knew it was me, but she no longer cared and still she lingered. One Friday I got a call from Manor Care. "Your mother has aspirated but we're watching her closely." I didn't realize what this meant. I didn't know that she was now Code Pink, wearing an oxygen mask with a rising temperature. I didn't know or I would have gone to her sooner. When I arrived Friday afternoon, her breath was ragged, draggingly difficult. She was engaged in such a struggle that she couldn't even talk to me. But she could hold my hand and we clung to each other for two days. Finally Sunday arrived. I sat with her from early morning, holding her hand and stroking her beautiful face. Then in the afternoon her hand slackened and it was no longer holding mine. I continue to hold her hand, stroking her soft skin with no response. Her grasping breath was hard to bear and even harder to watch. I began chanting what I knew would be my last Buddhist prayers with her, slowing the cadence of the chant to prolong them as long as I could. I knew without doubt that the ending of the prayer sequence would be the time she released. As my prayers reached out to our family no longer in the physical, I asked them to receive her and bring her into a lighter place, receiving her with joy. I asked them to make her smile again; to laugh with her again. It was then as I finished this request that my Mommy took three hard gasping breaths and stopped breathing to finally let go . It was not peaceful. It was not easy. And that is the truth I have at last faced.